Barack Obama's arrival in Washington by train today harkens back to the inaugural White House trip of the former President who is Obama's political idol: Abraham Lincoln. In 1861, our 16th President rode the rails through New York, New Jersey, and Pennsylvania en route to the capital. "He called it 'my circuitous journey,'" says Lincoln biographer Harold Holzer, an author or editor of 33 books about Lincoln, including his recently published "Lincoln: President-Elect." "He knew that it was a cockeyed itinerary meant to expose him to as many people as possible. They say 250,000 people saw him - more than had ever cast eyes on a President in the history of the country." Obama began in Philadelphia, where 148 years ago Lincoln stopped to raise an American flag outside Independence Hall, where the Declaration of Independence was ratified, though in Lincolns' time the flag had only 34 stars on it - one for every state in the then-smaller union. "It didn't recognize that seven states had seceded," Holzer says. The train rides are another symbolic link between Lincoln and Obama. The parallels range from the superficial - their tapered physiques, their young children living in the White House - to the serious: Lincoln freed the slaves, and Obama will be the first African-American president. 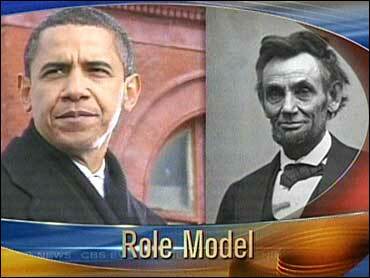 From the start of his political career, Obama seems to have modeled himself on Lincoln. Both were born in other states - Hawaii for Obama, Kentucky for Lincoln - before settling in Illinois. Each became a lawyer then served in the state legislature before serving a single term in Congress. Each rocketed onto the national political stage with powerful speeches and became commander-in-chief without any military experience. For Lincoln, the turning point was his 1857 speech at the Illinois state house for preserving the union. "A house divided cannot stand," Lincoln said, drawing inspiration from scripture. "I believe this government cannot endure permanently, half slave and half free." For Obama, the breakthrough was his 2004 keynote address at the Democratic National Convention, when as a little-known U.S Senate candidate he pleaded for unity. "There is not a liberal America and a conservative America, there is the United States of America," he said. "Lincoln and Obama shared a loved of words, a belief that rhetoric and oratory could change people's minds, and the way they would express things, the confidence they would have in a debate - not by fiery oratory, but by a calming presence, a reasoned argument," says Rice University History Professor Douglas Brinkley, also the presidential historian for CBS News. "Obama has learned from Lincoln, and what he's learned is how to hold a civil debate without giving up your main position, meaning you don't have to put your finger in your enemy's face and scold him. You can have dignity and composure and still win an argument," Brinkley says. Lincoln made sure a text of the Lincoln-Douglas debates was published, and it sold tens of thousands of copies in the months leading to the Republican National Convention in Chicago, where Lincoln's backers snatched the Presidential nomination from the frontrunner, Senator William Seward of New York. (Like Lincoln, Obama appointed his party's runner-up, Hillary Clinton, who held the same office as Seward, to be Secretary of State). In the 19th century, presidential candidates neither spoke at the conventions nor campaigned publicly in the fall. Instead, Lincoln's anti-slavery oration at Cooper Union in New York City became a campaign manifesto, similar to Obama's book, "The Audacity of Hope," his second best-seller following his memoir, "Dreams from My Father." "In a campaign culture in which Presidential candidates didn't speak, that (Lincoln) book was as important as Senator Obama's books in creating his public image," Holzer says. Last March, pushing his Lincoln connection, Obama used Cooper Union as his platform to call for major economic reforms. "Our free market was never meant to be a free license to take what you can get, however you can get it," Obama said. In a sense, both of their buzzwords as candidates was "change," because Lincoln was the first president elected on an anti-slavery platform. "He was the first candidate who expressed his refusal to allow slavery to move into the West just unobstructed, and that was a major change, and that was a change to which the Southern states reacted," Holzer says. On the campaign trail, Obama often said Lincoln was his favorite president, telling reporters once that during Senate "squabbling" he'd venture down to the Lincoln Memorial for a respite and to be reminded "of all the hard times that this country has gone through." Last weekend, Obama took his family there. With Lincoln often ranking atop historians' surveys of the greatest U.S. presidents, who wouldn't want the "Lincolnesque" moniker applied to them? Obama's circle goes further in portraying him as also fulfilling the legacies of John F. Kennedy and Martin Luther King. "What all of those men have in common is a kind of rallying the country together behind words," Brinkley says. "If people start to have the name Barack Obama uttered in the same breath as Martin Luther King or Abraham Lincoln, that's walking in pretty tall cotton." "All Presidents walk the corridor and think about Lincoln. They stare at his portrait. Richard Nixon used to drink gin and have the Secret Service take him to the Lincoln Memorial at night just to talk to Lincoln's statue," Brinkley says. Theodore Roosevelt wore a lock of Lincoln's hair in a ring on his finger. "We don't realize how hard it is to be President and how lonely it is in the White House," Brinkley says, especially when rebel troops are occupying Maryland and Virginia. "It's very hard to say who has a tougher job," says Holzer. "Is it the man who's facing a fiscal crisis worse than any since the Depression and also the specter of nuclear war, terrorism, health pandemics, and all of the issues that a 21st century president has to deal with and hopefully solve? Or is it the President who is facing the destruction of the entire country that he's been elected to lead?" The next parallel comes Tuesday, when Obama takes the oath as our 44th President, he will rest his hand on the very bible once owned and used by Lincoln at his first inauguration.